The IHA created its Student Design Competition in 1993 to invigorate the housewares industry with the fresh ideas of top student designers and to encourage young talent to consider careers in the housewares business. At the International Home + Housewares Show’s annual student competition display, the winning student designers meet business leaders and news media. Many have been hired by IHA member companies and home goods retailers; others have become entrepreneurs, educators and design managers for consumer products companies. Now in its 26th year, IHA’s competition is unique in the U.S. as the longest-running, industry-sponsored, merit-recognition program for industrial design students. 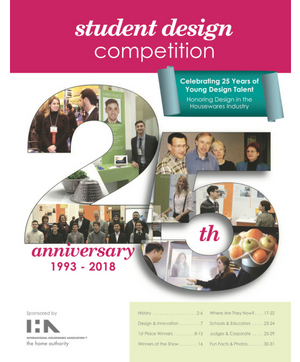 Learn about the 25-year history and the impact of IHA’s student housewares design competition in the 25th Anniversary booklet. Past winners also share how the program influenced their careers. The young housewares designers who created these thoughtful product concepts greeted visitors and met with industry leaders at the Student Design Competition display, located in the Lakeside Center Hall of Global Innovation at the International Home + Housewares Show, March 10 -13, 2018 at McCormick Place, Chicago. Be inspired by the creativity and skills of these talented innovators!